"It's too hot not to be in the water," says Iliana Rodriguez as we drive south on the Cancun-Tulum Highway on a hot summer day where the temperatures and humidity both seem to hover in the high 90s. Visiting Riviera Maya, that coastline of the Caribbean side of Mexico running south of Cancun, I had expected, in a truly North America way, that the streets of the small beach towns that line this stretch of the road would be empty. After all, who goes to a coastal area in Mexico during the hottest time of the year? The answer is just about everyone, according to Rodriguez, who is the public relations manager for Xcaret, a 500 acre eco park, just like we head to the beach in the U.S.
Rodriguez had picked me up at the hotel where my daughter Nia and I were staying, the luxurious Iberostar Paraiso Beach Hotel. So popular is the coastal area in the summer that the Iberostar's occupancy rate was 100 percent. But since the place has nine restaurants that include Japanese, Mexican, Brazilian and Mediterranean upscale dining and an endless series of connected pools that stretch almost to the beach, it doesn't seem crowded except for the walkway that leads to the spot where a dozen flamingoes sunned themselves near a fountain. That usually becomes a bottleneck as everyone with a camera, including me, stops to snap a photo. The flamingos are part of the Iberostar's concept of restrained jungle. Besides the flock of pink birds, path ways wander past thick clusters of low growing palms, bougainvillea and sweet smelling jacaranda while peacocks meander about and colorful parrots roost in trees. This feeling of manageable nature followed us to Xcaret, one of several eco theme parks along Highway 5, which connects Cancun to Tulum, a 100-mile journey. Around this area of Mexico ecology is serious business-maybe in response to the too quick build up of Cancun from a quiet fishing village to a Miami Beach lookalike in less than 30 years. At the Iberostar, each of the trees that was uprooted to build the resort was carefully preserved and then replanted. Further south, in the Bahia de Chetumal, which separates the state capitol of Quintana Roo, Mexico, from Belize, no boats are allowed in order to safeguard the manatees. Xcaret, which received the Tourism for Tomorrow Highly Commended 2002 Award for their sustainable, large scale tourism, is no exception. Though it was as packed as any Great America or Disney park would be, the people attending, mostly Mexicans, were enjoying the delights of horseback riding, watching native Mayan dancers perform, swimming in the natural ponds carved by nature out of rocks, viewing the sea turtles and manta rays in the aquarium and taking time out for contemplation in the open air cathedral that sits high upon a hill, its altar backed by a view of the Caribbean Sea. I pondered the differences between the packed and somewhat chaotic theme parks in America compared to Xcaret. The fastest moving events take place on two underground rivers. Choosing the Mayan River trip, Nia and I donned life vests and descended stone stairs through a cave to the river's openings. Once in the water, we floated gently at about two miles an hour through mangrove stands and into underground chambers, the river just chilly enough to refresh, enough natural light filtering in so that it wasn't complete darkness. Even my daughter who loves the high speed adrenaline rush of roller coasts was enchanted, asking if we could do it again. And so we did. Our next stop is to cavort with dolphins. Standing on platforms we feed dolphins who respond by nuzzling us, though in my case, the dolphin I'm feeding gets a little too cuddly and pushes me off the platform into deep water, seeming to laugh at my startled expression. Everyone, including Nia laugh, and I agree it must be funny. Homicidal dolphins aside, what's most fascinating about Xcaret is how well ecology melds with amusement Xcaret boasts the largest nesting site of pink flamingos in North America. Rodriguez relates the story about how, several seasons ago, a jaguar frightened the flamingo colony, causing the parent birds to flee, abandoning 587 unhatched eggs. Many of the eggs were placed in incubators and suddenly as many as 30 flamingo chicks were being born each day. Because neither Xcaret nor any other institution had ever dealt with this many baby flamingos at once, it took quite a bit of work keeping them safe and helping them thrive. But a majority made it and were re-introduced to the park. Visitors can see them as well as colorful toucans and parrots. Besides that, the park features an orchid farm, a butterfly pavilion and an oyster mushroom farm. According to Rodriguez, the cultivation of oyster mushrooms is way for Xcaret to help feed indigenous people whom couldn't afford meat. 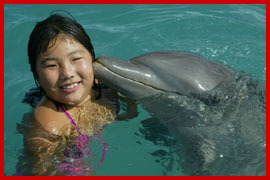 Mayans ruled this area of Mexico for centuries and Xcaret embraces that culture. In their Mayan Village there are craftsmen and women weaving rugs, carving wood in the shapes of the Mayan gods and goddesses, and spinning wool. Even the bathroom, done in a way reminiscent of how the Mayan's communal bath would have looked, is intriguing enough that people snap photos. Rodriguez is an environmentalist and she teaches me things I didn't know. One is to use bio-degradable suntan lotion. Before coming to this part of Mexico I had never heard of biodegradable suntan lotions, but they are advertised all over the place down here. The other kind kills both coral reefs and fish as well as sullies the waters. One of the most amazing moments for Nia and I is when we head to a small lagoon near the aquarium. Here, families snorkel in the warm water looking at schools of blue and yellow fish who swim so close that at times we wonder who is studying who. Mothers, fathers, grandparents and children splash in the water, share tips about the fish and enjoy themselves. I am, at this point, the only Norte Americana in sight. It's a moment where you feel connected to another culture, another country and it's a good moment. 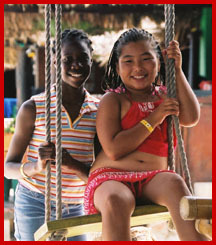 Before leaving Xcaret, Rodriguez, Nia and I stop to eat at one of the park's restaurants. Sitting underneath the pulapa on wooden benches, we watch chefs sear meat on wood burning grills as others mix salsas with mortar and pestle. Behind us, a fountain splashes and in the trees I glimpsed white orchids attached to the trees. Both Nia and I order, at Rodriquez's suggestion, the Mayan specialty cochinta pibil, spicy marinated chopped pork baked in banana leaves served with green, yellow and white tortillas-their colors coming from the different herbs and spices used for flavoring. For dessert, we all share a plate of crepas con cajeta a la crema de mezcal-crepes topped with milk caramel sauce and nuts served with vanilla ice cream and a touch of Mezcal. Both Nia and I are amazed, that in this simple restaurant in the middle of an amusement park, we have eaten one of the best meals we've ever had. For more info visit www.iberostar.com or www.xcaretcancun.com . ...... Jane Ammeson writes about travel, personalities and food and is a member of the Society of American Travel Writers. She writes frequently for Northwest Airline's World Traveler Magazine, Caribbean Travel & Life and the Chicago Tribune. She is also a food columnist for the Herald Palladium.